The short, conical bill identifies this bird as a finch or sparrow of some kind. Though not a finch or sparrow, juvenile Horned Larks are streaked below like our quiz bird and do look "sparrowish". Juvenile Horned Larks however have spotted, not streaked, upperparts. Of all our sparrows and finches, only one has the combination of a plain head, complete white eye ring, finely streaked underparts, and prominent white outer tail feathers, and that's Vesper Sparrow. This species used to be called Bay-winged Bunting, so named because of the reddish lesser coverts, which can be seen on our quiz bird. 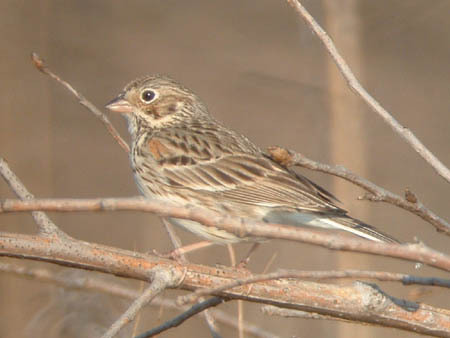 This Vesper Sparrow was photographed at the Kankakee Sands in Newton County, Indiana on April 22, 2006.